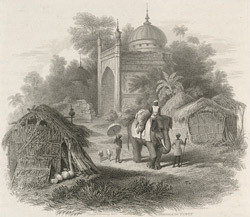 This vignette shows a mosque, native houses and merchants with a laden elephant approaching the city. British army surgeon James Atkinson wrote: "Dacca was for more than half a century the capital of Bengal, and continued to be enriched by the multitudes which crowded to the courts of its Governors. The stupendous remains of gateways, roads, bridges and other public works, which present themselves on every side, sufficiently prove the former grandeur of the magnificence of the city." This etching was based on George Chinnery's plate 14 in Charles D'Oyly's 'Antiquities of Dacca'.